Here are two packages of cat wrapping paper. 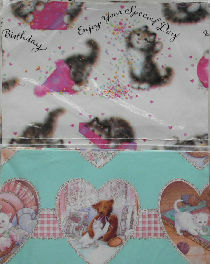 The birthday wrapping paper features a grey and white kitten and the words Enjoy Your Special Day, Happy Birthday. The other package shows a white kitten looking out a window, playing with a teddy bear etc. Each package contains one sheet of paper. Each sheet of paper is 8.33 square feet for a total of 16.66 square feet. Previously owned but unused. Packages unopened.